Michael Patrick "Murph" Murphy (7 May 1976 – 28 June 2005) was a United States Navy SEAL officer who was awarded the U.S. military's highest decoration, the Medal of Honor, for his actions during the War in Afghanistan. He was the first member of the U.S. Navy to receive the award since the Vietnam War . His other posthumous awards include the Silver Star Medal (which was later upgraded to the Medal of Honor) and the Purple Heart. The U.S. Navy ship USS Michael Murphy, and several civilian and military buildings have been named in his honor. Murphy was born on 7 May 1976 in Smithtown, New York to Irish American parents Maureen and Daniel Murphy, a former assistant Suffolk County district attorney and a veteran of the Vietnam War. He was raised in Patchogue. The name Murphy means "sea warrior" in Irish Gaelic. He attended Saxton Middle School, where he played youth soccer and pee-wee football, with his father as coach. In high school, he continued playing sports, and took a summer job as a lifeguard at the Brookhaven town beach in Lake Ronkonkoma. He returned to the job every summer throughout his college years. Murphy was known to his friends as "Murph", and he was known as "The Protector" in his high school years. In 8th grade, he protected a child with special needs who was being shoved into a locker by a group of boys, ending with Murphy physically pulling the attackers away from the child. This was the only time the principal of the school had to notify Murphy's parents of a disciplinary issue; his parents later reported that they "couldn't have been prouder." He also protected a man who was homeless, who was being attacked while collecting cans. He chased away the attackers and helped the man pick up his cans. In 1994, Murphy graduated from Patchogue-Medford High School and left home to attend The Pennsylvania State University (Penn State). He graduated in 1998, with a double major degree in political science and psychology. Murphy was engaged to be married to Heather Duggan with the ceremony scheduled for November 2005. Navy SEALs of Operation Red Wings, Murphy is on the far right. The map given to the U.S. Navy SEALs detailing their mission. After graduating from Penn State, Murphy applied and was accepted to several law schools, but decided to attend SEAL mentoring sessions at the United States Merchant Marine Academy. In September 2000, he accepted an appointment to the U.S. Navy's Officer Candidate School in Pensacola, Florida. On December 13 of that year, he was commissioned as an Ensign in the Navy and began Basic Underwater Demolition/SEAL (BUD/S) training in Coronado, California in January 2001, eventually graduating with Class 236 in November 2001. Upon graduation from BUD/S, he attended the United States Army Airborne School, SEAL Qualification Training and SEAL Delivery Vehicle (SDV) school. Murphy earned his SEAL Trident and checked on board SDV Team ONE (SDVT-1) in Pearl Harbor, Hawaii in July 2002. In October 2002, he deployed with Foxtrot Platoon to Jordan as the liaison officer for Exercise Early Victor. Following his tour with SDVT-1, Murphy was assigned to Special Operations Command Central (SOCCENT) in Florida and deployed to Qatar in support of Operation Iraqi Freedom. After returning from Qatar, he was deployed to Djibouti to assist in the operational planning of future SDV missions. Operation Enduring Freedom is the official name used by the United States Government for its War in Afghanistan, together with three smaller military actions under the umbrella of its Global War on Terrorism. The war began on 7 October 2001 with the response of the United States and United Kingdom to the September 11 attacks in New York City and Arlington, Virginia. In early 2005, Murphy was assigned to SEAL Delivery Vehicle Team ONE as officer in charge of Alpha Platoon and deployed to Afghanistan in support of Operation Enduring Freedom. Operation Red Wings was a counter-insurgent mission in Kunar province, Afghanistan, involving four members of the United States Navy SEALs. Murphy and two other SEALs, Danny Dietz and Matthew Axelson, were killed in the fighting, in addition to 16 U.S. special operations soldiers, who were killed when their helicopter was shot down while attempting to extract the SEAL Team. Prior to a helicopter being shot down in 2011, it was both the largest loss of life for U.S. forces since the invasion began and the largest loss for the SEALs since the Vietnam War. Marcus Luttrell was the only surviving U.S. sailor from the squad; he was protected by local villagers, who sent an emissary to the closest military base, allowing a rescue team to locate him. Murphy was the Commander of a four-man reconnaissance team, they were on a mission to kill or capture a top Taliban leader, Ahmad Shah (code name Ben Sharmak), who commanded a group of insurgents known as the "Mountain Tigers," west of Asadabad. The team was dropped off by helicopter in a remote, mountainous area east of Asadabad in Kunar Province, near the Pakistan border. After an initially successful infiltration, local goat herders stumbled upon the SEALs' hiding place. Unable to verify any hostile intent from the herders, the team cut them loose. Hostile locals, possibly the goat herders they let pass, alerted nearby Taliban forces, who surrounded and attacked the small group. After Murphy called for help, an MH-47 Chinook helicopter loaded with reinforcements was dispatched to rescue the team, but was shot down with an RPG, killing all 16 personnel aboard; eight SEALs and eight service members from the 160th SOAR. Murphy, Dietz, and Axelson were killed in the action. Luttrell was the only U.S. survivor and was eventually rescued, after several days of wandering in the mountains and being protected by the people of an Afghan village. All three of Murphy's men were awarded the Navy's second-highest honor, the Navy Cross, for their part in the battle making theirs the most decorated Navy SEAL team in history. Murphy was killed on 28 June 2005 after he left his cover position and went to a clearing away from the mountains, exposing himself to a hail of gunfire in order to get a clear signal to contact headquarters for relaying the dire situation and requesting immediate support for his team. He dropped the satellite phone after being shot multiple times but picked the phone back up and finished the call. While being shot, he signed off saying- "Thank You", then continued fighting from his exposed position until he died from his wounds. On 4 July 2005, Murphy's remains were found by a group of American soldiers during a combat search and rescue operation and returned to the United States. Nine days later, on 13 July, Murphy was buried with full military honors at Calverton National Cemetery. 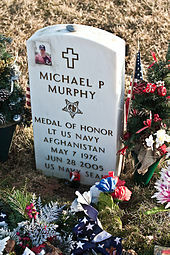 On 11 October 2007 The White House announced Murphy would be presented the Medal of Honor, awarded posthumously, during a ceremony at the White House on 22 October 2007. The Medal of Honor is the highest military decoration awarded by the United States government and is bestowed on a member of the armed forces who distinguishes himself "... conspicuously by gallantry and intrepidity at the risk of his life above and beyond the call of duty while engaged in an action against an enemy of the United States ..." Due to the nature of the award, it is commonly presented posthumously. The parents of Lt. Murphy receive his medal from President Bush. 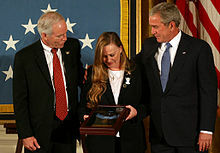 On 22 October 2007 the Medal of Honor presentation ceremony was held at the White House. President George W. Bush presented Murphy's Medal of Honor to his parents. While leading a mission to locate a high-level anti-coalition militia leader, Lieutenant Murphy demonstrated extraordinary heroism in the face of grave danger in the vicinity of Asadabad, Kunar Province, Afghanistan. On 28 June 2005, operating in an extremely rugged enemy-controlled area, Lieutenant Murphy's team was discovered by anti-coalition militia sympathizers, who revealed their position to Taliban fighters. As a result, between 30 and 40 enemy fighters besieged his four member team. Demonstrating exceptional resolve, Lieutenant Murphy valiantly led his men in engaging the large enemy force. The ensuing fierce firefight resulted in numerous enemy casualties, as well as the wounding of all four members of the team. Ignoring his own wounds and demonstrating exceptional composure, Lieutenant Murphy continued to lead and encourage his men. When the primary communicator fell mortally wounded, Lieutenant Murphy repeatedly attempted to call for assistance for his beleaguered teammates. Realizing the impossibility of communicating in the extreme terrain, and in the face of almost certain death, he fought his way into open terrain to gain a better position to transmit a call. This deliberate, heroic act deprived him of cover, exposing him to direct enemy fire. Finally achieving contact with his headquarters, Lieutenant Murphy maintained his exposed position while he provided his location and requested immediate support for his team. In his final act of bravery, he continued to engage the enemy until he was mortally wounded, gallantly giving his life for his country and for the cause of freedom. By his selfless leadership, Lieutenant Murphy reflected great credit upon himself and upheld the highest traditions of the United States Naval Service. During his military career, Murphy received 11 different military decorations, including: the Medal of Honor, Purple Heart, Joint Service Commendation Medal, and Navy Commendation Medal. Since his death, the high school he attended, a post office in his home town, a park and a guided missile destroyer, the USS Michael Murphy (DDG-112), have been named in his honor. In addition to the Medal of Honor, his military awards and his inscription on the Hall of Heroes in the Pentagon, Murphy has received several other honors. The Penn State class of 2011's senior gift was a memorial named after Lt. Michael P. Murphy to commemorate all veterans who served the United States. The wall behind the memorial is inscribed with a Greek phrase meaning "With it [your shield], or on it" referencing the ancient Spartan tradition that a warrior came home from a battle "with his shield" after a victory, or dead being carried home "on his shield" after a defeat. A greek warrior could not escape the field of battle unless he tossed away the heavy and cumbersome shield. Therefore, "losing one's shield" meant retreat. On 7 May 2006, on what would have been his 30th birthday, Murphy's hometown dedicated the Michael P. Murphy Memorial Park; formerly Lake Ronkonkoma Park. The park contains a black granite wall dedicated to the men lost in Operation Red Wings, with each member's name inscribed. A black granite stone embedded in the plaza bears the picture of Murphy and his Medal of Honor. Daniel and Maureen Murphy stand next to a monument in front of the Lieutenant Michael P. Murphy Post Office in Patchogue, New York. On 7 May 2007, the Lieutenant Michael P. Murphy United States Post Office was dedicated in Patchogue, New York. The request to rename the historic United States Postal Office located at 170 East Main Street in Patchogue, New York, was submitted as bill H.R. 4101 to the 109th Congress. On 3 January 2006, the 109th Congress approved the request and on 1 August 2006, it was signed by President George W. Bush and became Public Law No: 109-256. The facility of the United States Postal Service located at 170 East Main Street in Patchogue, New York, shall be known and designated as the 'Lieutenant Michael P. Murphy Post Office Building'." Maureen Murphy breaks a bottle of champagne to christen the ship named after her son, USS Michael Murphy. On 7 May 2008, Secretary of the Navy Donald C. Winter announced that DDG-112, the last planned U.S. Navy Arleigh Burke-class destroyer at the time, would be named USS Michael Murphy (DDG-112) in honor of Murphy. On 7 May 2011, on what would have been Murphy's 35th birthday, USS Michael Murphy was christened by his mother Maureen Murphy, the ship's sponsor. Guests tour the new Lt. Michael Murphy Combat Training Pool during a dedication ceremony at Officer Training Command, Newport. The pool will be used by officer candidates and students at Officer Training Command Newport for swim qualifications. On 9 July 2009, the newly constructed Combat Training Pool at the Naval Station Newport, Rhode Island was dedicated in honor of Murphy. The pool is an L-shaped, 8-lane pool which holds approximately 347,000 gallons of chlorinated water. The training pool also has a training platform three meters above the water which is used for military training, abandon ship drills, etc. The Lt. Michael P. Murphy Award in Geospatial Intelligence recognizes achievement by a Penn State graduate student who is serving or has served in the U.S. Armed Forces or with the U.S. Intelligence Community and demonstrated exceptional contributions to the discipline. The award was made possible by the gracious gifts of GeoEye and the US Geospatial Intelligence Foundation. This award is endowed to be given in Murphy's name in perpetuity. 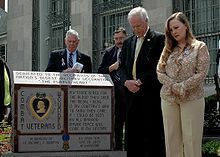 On 2 November 2010, it was announced the senior gift for the Pennsylvania State University (Murphy's alma mater) Class of 2011 will be the Lt. Michael P. Murphy/Penn State Veterans Plaza. The plaza will honor all Penn State veterans and Penn State's only Medal of Honor recipient, Murphy. The United States Veterans Hospital at Northport Long Island New York maintains a memorial plaque that names all of the Medal of Honor recipients who have lived in Long Island. Lt. Murphy's name was placed in honor on this memorial shortly after he was awarded the Medal of Honor. Others honored include President Theodore Roosevelt, General Theodore Roosevelt, Jr., and Murphy's fellow Eastern Long Island hero Garfield Langhorn. The Memorial, which is at the back end of the hospital lobby, is in close proximity to where his mother works in the hospital. 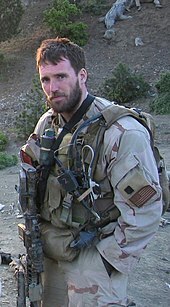 In April 2014, Patchogue-Medford High School in Medford, New York, named its campus the "Navy (SEAL) Lt. Michael P. Murphy Campus" after its fallen former pupil. The Sea Cadet unit from West Sayville, New York is named the "Lt. Michael P. Murphy Division" and has hosted and sponsored events in honor of Murphy. The Fort Hamilton MEPS main lobby has a memorial wall dedicated to Murphy. The Central Pennsylvania council of the Navy League of the United States awards the "Lt. Michael P Murphy Distinguished Citizen Award" in his name. The award honors living, non-active duty citizens who exemplify his character and commitment to his country and his community. A workout named in Michael's honor is often performed at CrossFit affiliates across the globe on Memorial Day. The workout is named "Murph" and consists of a 1 mile run, 100 pull-ups, 200 push-ups, 300 air squats, and a final 1 mile run. The pull-ups, push-ups, and air squats can be partitioned and scaled as needed. Participants are encouraged to wear a 20lb body vest. This workout was one of Murphy's favorites. He called it "Body Armor". In the 2013 film Lone Survivor, Murphy is portrayed by actor Taylor Kitsch. ^ Applies to all awards listed in the table. ^ a b c d e f g h i j k "LT MICHAEL P. MURPHY USN". United States Navy. October 2007. Retrieved 9 July 2009. ^ MacLysaght, Edward (1991). The Surnames of Ireland. Irish Academic Press. p. 221. ISBN 978-0-7165-2366-6. ^ Williams, Gary (2010). SEAL of Honor. Naval Institute Press. p. 220. ISBN 978-1-59114-965-1. ^ Brown, Derek (27 September 2001). "Attack and Aftermath: a glossary of terms,". London: Guardian Unlimited. Retrieved 12 May 2010. ^ Rivera, Ray; Rubin, Alissa J.; Shanker, Thom (6 August 2011). "Copter Downed by Taliban Fire; Elite U.S. Unit Among Dead" – via www.nytimes.com. ^ Boone, Jon (6 August 2011). "Worst US loss of life in Afghan war as helicopter crash kills 38" – via www.theguardian.com. ^ Blumenfeld, Laura (11 June 2007). "The Sole Survivor – A Navy Seal, Injured and Alone, Was Saved By Afghans' Embrace and Comrades' Valor". Washington Post. p. A01. Retrieved 10 March 2010. ^ Luttrell, Marcus (2008). Lone Survivor. Little, Brown and Company. ^ Bahmanyar, Mir & Chris Osman. Seals: The US Navy's Elite Fighting Force (21 October 2008 ed.). Osprey Publishing. pp. 145–146. ISBN 1-84603-226-1. ^ Naylor, Sean D. (18 June 2007). "Surviving SEAL tells story of deadly mission". Army Times. Retrieved 21 July 2008. ^ Matt Dupee (17 April 2008). "Bara bin Malek Front commander killed in Pakistani shootout". long war journal. Retrieved 10 December 2008. ^ "Matthew Gene Axelson". Military Times. Hall of Valor. Archived from the original on 9 May 2012. Retrieved 6 August 2009. ^ "Lt. Michael P. Murphy, USNavy SEAL awarded MOH posthumously". www.sealtwo.org. ^ a b c The White House (22 October 2007). "President Bush Presents Medal of Honor to Lieutenant Michael P. Murphy, U.S. Navy" (Press release). Office of the Press Secretary, The White House. Retrieved 23 October 2007. ^ "Defense link Medal of Honor history". U.S. Department of Defense. Archived from the original on 15 June 2009. Retrieved 10 March 2010. ^ "Medal of Honor citation". United States Navy. Archived from the original on 13 January 2009. Retrieved 22 October 2007. ^ a b "SECNAV Names New Guided-Missile Destroyer USS Michael Murphy". United States Navy. 7 May 2008. Retrieved 13 July 2009. ^ "TOWN PARK RENAMED IN HONOR OF FALLEN HERO". Brookhaven City Council Website. 12 May 2006. Retrieved 13 July 2009. ^ Lykins, Lt. Lesley (9 May 2008). "Patchogue Citizens Remember Lt. Michael Murphy". United States Navy. Retrieved 31 July 2009. ^ "Fallen Navy SEAL honored with warship". USA Today. 8 May 2011. Retrieved 8 May 2011. ^ Thornbloom, Scott A. (17 July 2009). "Newport Combat Training Pool Dedicated to MOH Recipient". Naval Service Training Command Public Affairs Office. Retrieved 24 March 2010. ^ "Penn State Veterans Plaza, 2011 class gift, to be dedicated Sept. 14". news.psu.edu. 10 September 2012. ^ HOEY, PEGGY SPELLMAN. "High school campus to be named after sailor". ^ "The Navy League of Central Pennsylvania". www.navyleague-centralpa.org. Retrieved 27 February 2016. ^ a b Zittle, Anna (20 May 2017). "Navy Lieutenant Michael Murphy Remembered Through CROSSFIT Wod". The Lasco Press. Retrieved 26 May 2017. ^ a b Cotto, Andrew (1 November 2013). "CrossFit's Navy SEAL Workout". Men's Journal. Retrieved 26 May 2017. Luttrell, Marcus (2007). Lone Survivor: The Eyewitness Account of Operation Redwing and the Lost Heroes of SEAL Team 10. Little, Brown and Company. ISBN 0-316-06759-8. Drew, April (17 October 2007). "Highest Honor for Afghan War Hero". Irish Abroad. Archived from the original on 5 June 2011. Evans, Martin C. (11 October 2007). "Slain Patchogue sailor to get Medal of Honor". Newsday. Archived from the original on 22 December 2007. Hernandez, Raymond (22 October 2007). "A Protector as a Child, Honored as a Hero". New York Times. Williams, Gary (2011). Seal of Honor: Operation Red Wings and the Life of Lt. Michael P. Murphy, USN. Naval Institute Press. ISBN 1-59114-965-7. Winerip, Michael (11 November 2007). "Recognizing the Honor of a Son". New York Times. 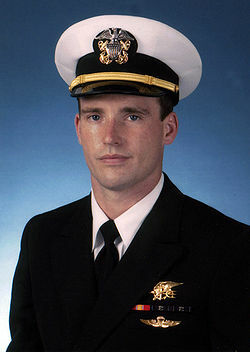 Wikimedia Commons has media related to Michael P. Murphy.